Glenavon missed a chance to go third after losing 1-0 to champions elect Crusaders at Mourneview Park on Saturday. With Cliftonville slipping up against Glentoran, a point would have been enough to see Gary Hamilton’s side go above the Reds, but they only have themselves to blame as they had the chances to take something out of the game. Ian Morris made his first start for the Lurgan Blues and he prompted the first incisive move on four minutes with a pass to Kevin Braniff, he turned and played through Andy Hall who in turn squared for Eoin Bradley but Crues keeper Sean O’Neill made a superb save. Hall then did well to shake off his marker and whip in a good cross but it was well claimed by the keeper. The Crues went close with Jordan Owens side footing over the bar and as the play flowed end to end Hall again sent in another superb cross to the far post but Joel Cooper could not get the vital touch. It was very even in this solid start by both teams but the home side spurned another great chance on 28 minutes after Cooper broke and fed Bradley on the edge of the box but his drive was blocked by the keeper. Bradley then picked up a yellow card for dissent after he failed to win a free kick in a challenge by Colin Coates. Not long after Coates followed him into the book with a high boot in Bradley’s face. From the free kick Hall drove his shot into the wall and from the rebound he lashed the ball well over the bar. 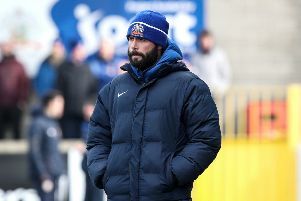 Glenavon continued to look the dangerous as Hall and Bradley combined to set up Braniff but Billy Joe Burns blocked his shot from inside the box. The second half was only minutes old when Gavin Whyte was booked after he went down far too easily in the box after Dillon stepped in to make a challenge. That pressure eventually told on 57 minutes with Crusaders taking the lead as Whyte floated a free kick into the box and Owens was in space to head past Tuffey. Five minutes later Glenavon should have levelled when Bradley got in behind but he took too long to get his shot away and his way to goal was blocked. Glenavon did mount a much better challenge midway through the half but could not thread their way to a clear opening. The Crues always looked dangerous on the break and Owens drilled a shot off the base of the post on 80 minutes. Gary Hamilton came off the bench but no sooner did he enter the action he picked up a yellow card for protesting too strongly after a challenge by Coates. A rare mistake by the Crues allowed Martyn to pass to Braniff but his attempted shot was wide of the mark. Tuffey did well to push away a stinging shot by Whyte to keep the Lurgan Blues in with a chance of salvaging a point. To their credit they pushed right to the end and that last chance came in added time with Braniff chipping into the box and Fabio got up at the back post but his header flew inches wide. Glenavon: Tuffey, Morris, Dillon, Lindsay, Kilmartin, Marshall, Cooper, Bradley, Hall, Braniff, Martyn. Subs: Patton, O’Brien, Hamilton, Delaney, McGrath.